It seems that when you become a world-acclaimed celebrity, the next step in your career is to come out with a beauty line, whether it's your own or a collaboration with a famous brand. The recent years have demonstrated that harnessing celebrity star status is a winning strategy for the beauty industry. There is no denying that a famous face can significantly increase sales due to the publicity, which is often free, thanks to social media. Just think Riri's Fenty Beauty or Victoria Beckham for Estee Lauder. 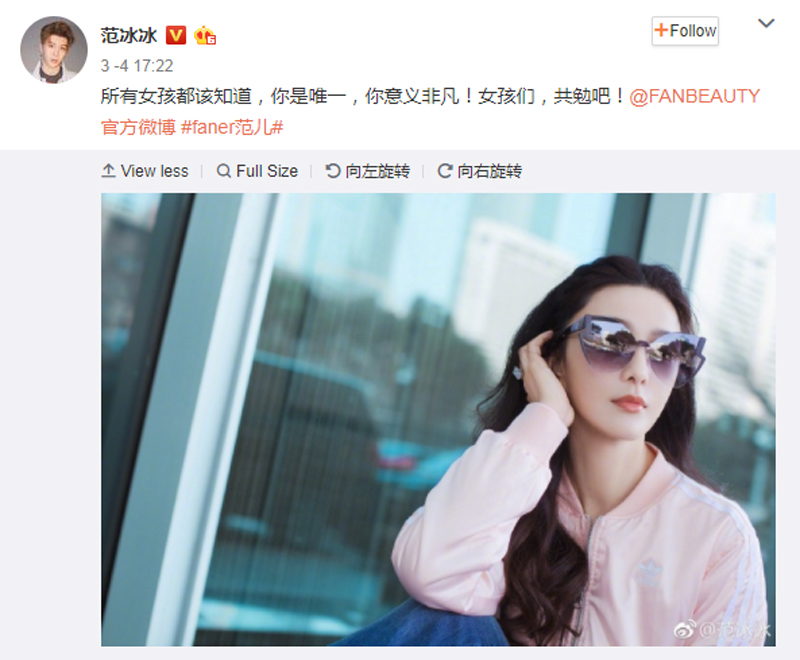 The latest celebrity beauty line that is making waves is Fanbeauty - an eponymous beauty brand started by Chinese superstar Fan Bing Bing on the Mar 1, 2018, that is built on the mission to impart what she knows about beauty to her consumers. Each of the products in her line is developed with her careful oversight, ensuring that they are all items she herself would actually use. Fan Bing Bing is known for her porcelain complexion and strict skincare regimen - she always carries an umbrella when she is outdoors and always wear sunscreen, even when she is sitting in front of a computer screen and goes through at least 600 sheets of facial masks every year. So it comes as no surprise to see that the first product launched is a facial device - Fanbeauty Up. While the chances of us mere mortals attaining Fan Bing Bing's well-manicured v-shaped visage is close to none, you can at least fake her higher than high cheekbones with this new beauty device. The device helps to massage the face in a circular motion and promises to stimulate circulation, drain lymph nodes, and tighten superficial facial muscles to temporarily firm the skin and stimulate collagen production. While the Fanbeauty Up facial device is rivalled by other brands in the market like ReFa. Exideal, Artistic&Co and Yaman, one major point of difference Fanbeauty has from its competitors is its input and endorsement from the "My Fair Princess" actress. Fan Bing Bing was said to be heavily involved in the product development process, lending credibility and authenticity to the brand. According to China Daily, the actress would visit beauty trade shows and factories in her free time to learn more about the science and mechanics of beauty devices. She was also one of the first testers of the Fanbeauty Up device. It seems her hard work paid off. The official Fanbeauty Weibo microblog page has garnered over five million fans since it was started in November last year. The Fanbeauty Up device retails for 2,399 Yuan (S$499) and is sold on Tmall.com.